In 1970, Yelm had 632 people and an assessed property value under a $1 million; today, it has over 1,100 people and an assessed property value of $17.6 million. It is Thurston County’s fastest growing town. “Watch it,” the passenger said to the driver as they passed the 35 mph speed limit sigh which stands just inside the Yelm city limits on Highway 510. “The cops will get you here.” The driver nervously chuckled, then tapped his brakes, slowing the car down from 40 to 35 mph. A mustachioed man in a policeman’s uniform was operating a radar gun from behind his patrol car’s steering wheel. Although speed traps might be “typical” of some small towns, that is not true in Yelm. Only two speeding tickets were issued last month. But Yelm is guilty of having a few “typical” characteristics of small towns. And one of the characteristics is that it is slowly (but too rapidly for some) changing from a small town to a large town — complete with shopping centers, higher taxes, rising property values, crime, traffic hassles, more churches and schools. About the only two things that haven’t come to Yelm in the last 10 years are better streets and more taverns. Folks in these parts even have come to realize that Yelm no longer is a one-horse town that no one ever heard of. “Anymore, when you tell people in Olympia that you live in Yelm, they don’t say, ‘Oh, you live clear out in Yelm?’ Yelm has come into its own,” said Roberta Longmire, president of Yelm Business Association. Although Yelm remains one of Thurston County’s smaller towns, it is the fastest growing community in Thurston County, based on the 1980 census figures. And Thurston County is among the fastest growing areas in the nation, according to Yelm Mayor Lora B. Coates who was quoting a recent article found in the Wall Street Journal. The population had been stagnant for many years before 1970, when 632 persons called Yelm home. Since then, the population increased by 82 percent, to 1,152. A large portion of the growth has occurred through annexations of areas which later grew in population. 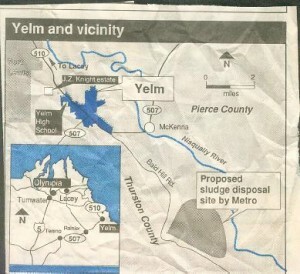 In 1970 Yelm’s borders covered 246 acres. Today, it covers 642 acres. Its appraised property value in 1970 was $955,468. Today it is more than $17.6 million. Mrs. Isom works at the Top of the Box hamburger shop, a building which is in the shape of a cheeseburger. The building itself is a symbol of Yelm’s growth. Three years ago it was moved to the Wolf’s Shopping Center parking lot from Seattle. Mrs. Isom hit on a common reason more folks are moving to the small, rural towns. The people in the small town setting feel they are a greater part of the community because everyone knows each other. But there are other reasons city dwellers are pulling stakes and moving to the hinterlands. Among them – escape. Small towns, she said, “have a completeness about them.” They are attractive because modern businesses and services are there, but the rush of the cities isn’t. “It’s just a scale that is more manageable for them,” Ms. Dobbs said. Long-time resident, fire chief and ARCO service station ‘ owner George Cowles goes along with Ms. Dobbs’ observations. He says Yelm’s growth has gone in cycles. Back in the late 1920s when 7-year-old Cowles moved with his family to Smith Prairie, which is in the Bald Hills, Yelm was going through a period of growth. Growth was slow but steady up until World War II. When he war ended, the sociological rend around the nation was a return to the cities. That says Cowles, was when Yelm’s growth became stagnant population stayed fairly constant. 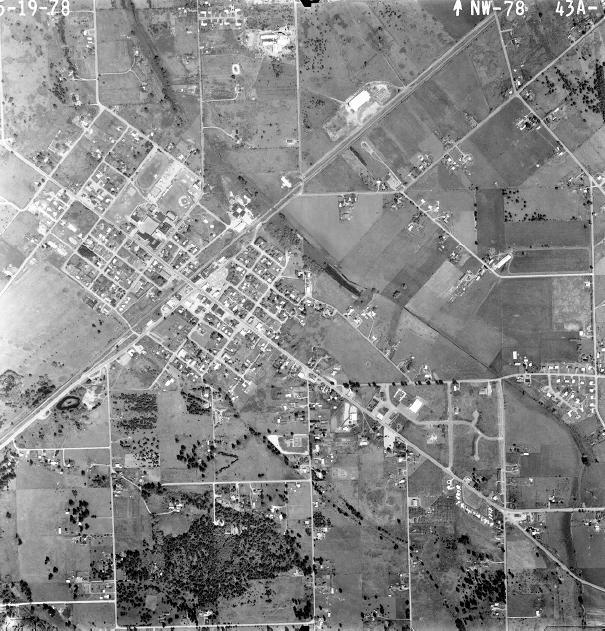 Folks began leaving the large towns and cities, Cowles said the migrants mainly were young middle-class persons who had lived the good life with their parents during the 50s and 60s. He said the young people seemed to realize the “good life” wasn’t really very “good.” So they broke away from the cities and the middle class life. Some of those young folks found their way to Yelm. It’s that same kind of instinct that attracted newcomers to the rural, pastoral setting of the small town, which lies just south of the Nisqually River near the Pierce County line. One important feature about Yelm’s growth is that most of it is occurring outside the downtown area. Much of the main street looks just as it did 10 years ago. Storefront signs haven’t even changed much. Businesses which have cropped up in Yelm during the last 10 years include Jayhawks Shopping Center, Pioneer Village (which contains a vacuum cleaner store, a restaurant, a chiropractor’s office, a jewelry store and a health food store),two new doctors, two attorney’s, and a couple of chiropractors. But with the baby comes the bathwater. In Yelm’s case this means increased crime, the need for increased government services and more money to run the school district. Although crime statistics weren’t kept in Yelm for eight out of the last 10 years, Yelm Mayor Lora B. Coates said the major growth strain has fallen on the police department. In 1970, the town got by with a one-person police department. But now, the department has eight persons, two of whom are dispatchers. The most startling effect on the crime rate is the use of drugs, mostly marijuana, and burglaries. “The growing pains are terrific,” said Louise Longmire, director of the Yelm Senior Center. “We’ve got a lot of problems with dope. We can sit here (at senior center which is on the main street and a few doors down from the police department) and see it going on. It doesn’t do any good to turn them in.” Mrs. Longmire adds there have been three break-ins at the senior center during the last year. “We can’t be as trustworthy as we used to be,” said Fire Chief Cowles. “Most of the crimes are kids’ things.” He agreed most of the serious crime involve burglaries. The city crew also has increased. The water and street department 10 years ago got by with one person. There were 187 city water customers. Now, there are more than 400 customers, and the department needs a water superintendent, a part-time water maintenance man and a part-time clerk. The city administration 10 years ago only needed one clerk. Now it needs her, Lyla Eide, and a part-time clerk. The school district, which includes McKenna, also has had to expand to cope with the growth. According to school district records, the district school population increased from the 1,424 in 1970 to the present enrollment of 2,035. In 1971 Southworth Elementary School was built, and in 1976 enlarged. The McKenna Elementary school was enlarged in 1977. The new Yelm High School was built in 1978. Yelm School district also is facing a levy and three bond issues for 1981-82 school year. The levy is for $718,171 for maintenance operations, transportation and extracurricular activities. The first bond issue is for $3.7 million for a new elementary school and remodeling the middle school. The second, for $990,000, is for building outdoor sports facilities such as a track, five tennis courts, a football field (no stadium) and a baseball field at the high school. The third bond issue, for $700,000, is for a swimming pool at the high school. In general, it is difficult to determine if growth has helped or hurt Yelm. That, as in beauty, is in the eye of the beholder. YELM — If Western Washington is growing, Yelm is exploding. Just a decade or so ago, this prairie town’s streets were usually deserted and most of its residents were acquainttances. To save money on shopping, people drove to Olympia or Tacoma. Today, cars, campers and trucks lumber along state Route 507 through Yelm at all hours of the day. And while residents can do most of their bargain-hunting in town, they are unlikely to see a familiar face. Between 1970 and 1980, the town’s population doubled. Since then the population has swelled by 6 percent a year, or twice as fast as the rest of Thurston County. Those statistics are not reflected on the town’s main street, which with its taverns, hardware store and bowling alley resembles small towns across America. City park signs warn residents the area is off-limits to horses. But the inhabitants tell a different story — in recent interviews with bypassers, it was unusual to find anyone who had lived in Yelm for longer than 10 years. Outside town limits, the countryside bustles with signs advertising anything from one to 200 acres for sale. “We haven’t sold all the land we have listed, but we’ve sold a hell of a lot of it in the last two to three weeks,” said Yelm Realty salesman George E. Jones. Much of the growth is invisible, tucked away in pockets of development in unincorporated areas like Lake Lawrence, Clear Lake and the dense Nisqually Pines single-family subdivision just north of town. With an abundant supply of affordable land located 20 miles from offices in both Olympia and Fort Lewis, southeast Thurston County has become a haven for commuters and retirees. A 35,000-year-old spirit named Ramtha also has attracted flocks of followers to a $1.5 million mansion on the outskirts of town. Nobody knows precisely how many devotees of spiritual channeler J.Z. Knight have relocated to the Yelm area, but estimates range from the hundreds to more than a thousand. So far Yelm’s population spurt has attracted no major new industry, no motels, and not even a McDonald’s. But small stores have sprung up to sell everything from sweat clothes to real estate along state Route 507, which shows signs of becoming a Lacey-style strip. Shuddering at that prospect even as they welcome the new businesses, Yelm officials hope that a planned $7 million sewer system will direct growth back into town boundaries by making development there more attractive. Town officials also are studying street improvements and seeking new industries in an effort to broaden Yelm’s economic base. Several pressing issues have unified the community in recent years as residents rallied against arson and sludge. The arsons began several years ago, and included a blaze that caused $80,000 to Yelm City Hall. Following an April 30, 1988 string of fires that damaged churches, businesses and an abandoned house within a square-mile area, residents and businesses put together a$20,000 reward for information leading to the arrest of an arsonist who had plagued the town for several years. The reward has not been collected, but the fires stopped after the February 1989 arrest of a leading suspect. “It’s past history,” said Lawton of the town’s arson problem. Concerns about sludge remain strong. The worries first surfaced a year ago, when a group called Nisqually Valley Neighbors for a Contaminant-Free Prairie announced itsexistence at the annual Prairie Days parade. Such well-known Yelm area residents as actress Linda Evans and channeler J.Z. Knight have argued passionately against a proposed sludge disposal project on timberland in the Bald Hills. They fear chemicals and heavy metals in the sludge could pollute both groundwater and the nearby Nisqually. formally support the effort, but the fierce community opposition has led the Municipality of Metropolitan Seattle to put its plans on hold for two years. The struggles against arson and sludge have contributed to an upsurge in community pride, which asserts itself at the town’s entrances in the form stylish new signs with the slogan “Pride of the Prairie” — a motto also available on sweat shirts, which cost $18 at city hall. And a recent Prairie Days parade attracted hundreds of spectators, who lined up several rows deep. “It was so jammed that you couldn’t even see the parade,” said Yelm Realty’s Jones. Newcomers say they selected Yelm for the rural lifestyle, for the school district and the beautiful natural surroundings. Situated on a flat, grassy prairie near the Nisqually River, the town is dominated on clear days by the looming, snow-streaked mass of Mount Rainier. With less than 11,000 residents in southeast Thurston County, the Yelm countryside feels far from crowded. But some worry that traffic and other problems will worsen in the coming decade, during which Thurston County planners expect the southeast county’s population to reach nearly 18,000. The city hopes to ease some complaints with a $450,000 project intended to improve the town’s main intersection. Construction begins this week. But town and state officials have no immediate plans for dealing with two top local desires: widening state Route 507 from two lanes to four, and adding at least one more traffic light. Worsening the traffic is the popularity of Ramtha, whose seminars can draw as many as a 1,000 people to the Knight mansion on state Route 507 just outside town. When those events let out, unlucky passersby find themselves stuck in big-city traffic jams. “The city joke is — they wear sweat pants,” said Lillian L. Lowe, 57.
educated, peaceful and frequently affluent. Yelm Thriftway manager David G. Anderson estimates that a major gathering at Knight’s mansion brings his business as much as $6,000. “I think the community has been quite receptive to her activities,” said Edwards. Except for her involvement in the sludge battle and the conspicuous location of her fenced, sprawling mansion, Knight maintains a low profile around town. She said through a spokesperson last week that she was unavailable for an interview, and her staff members declined to discuss her impact on the community. claim seems exaggerated. Dr. Elledge, who is acquainted with Knight and whose Nisqually Clinic is located only a short distance from her estate, said that Ramtha devotees account for only a small percentage of his patients. “It gives us something to talk about,” said Elledge, a slim man with a salt-and-pepper beard who moved to Yelm 10 years ago. Although some Ramtha followers and other new residents reportedly are bringing substantial wealth to the Yelm area, the area remains characterized by mobile homes, vehicle-cluttered lawns and low family incomes. In the 1980 census, Yelm residents reported a median annual income of $11,977, compared to an average countywide income of $17,946, with 16 percent of all residents living below the poverty level. Yelm’s school district serves free or reduced-price lunches to 55 percent of its students, and has trouble convincing teachers to move to the area due to a lack of middle-class housing. And while growth has brought plenty of people to the county, there have been few new jobs. Yelm officials have sought to attract new business to downtown with a revitalization program that has brought two streetlights to downtown and face lifts to most storefronts. 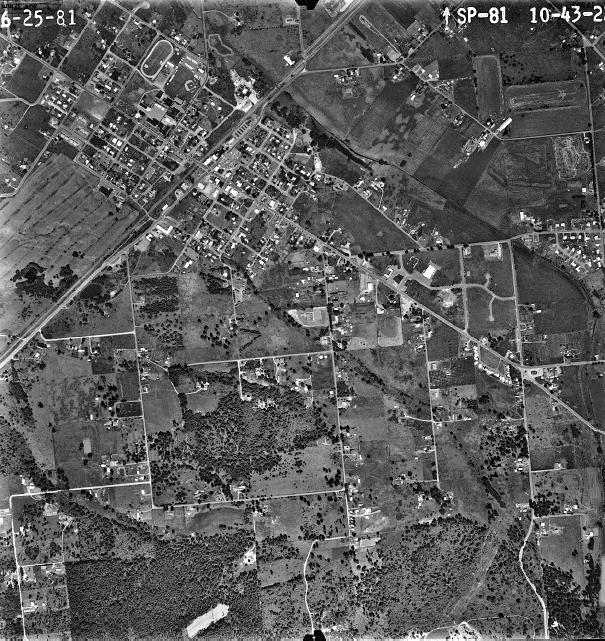 The decision to construct a sewer system followed the discovery of increased nitrate no levels in town wells. Although the project’s main goal is to protect water quality, City Clerk Shelly A. Badger said the sewer system will allow development which formerly would have required prohibitively large septic tanks. “We’ve had projects killed just because there’s not a sewer system here,” she said, adding that motels, large restaurants and multifamily housing could follow once the sewer system is completed. But whether Yelm eventually emerges as a small city or an extensive suburb may depend on unknown factors such as the price of gasoline and the willingness of companies to move to Thurston County. Whatever the future holds, some residents will continue to recall with fondness the days when Yelm was a more neighborly place. Location: The town of Yelm is located in southeast Thurston County near the Pierce County border. Olympia is 20 miles to the northwest, while the employment center at Fort Lewis is 20 miles to the northeast. Population (unincorporated southeast Thurston County): 9,060. Median income, 1980 census: $11,977. Largest private employer: Hytec Inc., 144 employees. Hytec makes showers, hot tubs and other fiberglass bath products. Largest public employer: Yelm Community Schools, with more than 300 employees. Government: Mayor-council system. The mayor appoints city employees and presides over council meetings, but only the five council members vote. Salaries are $315 a month for the mayor, $100 a month for council members. Schools: Yelm Community Schools includes a high school, a middle school and three elementary schools serving 3,100 students. A new elementary school is expected to open by the fall of 1990. Geography: Yelm is located on a flat prairie about 340 feet above sea level. To the south, the land slopes uphill to the Bald Hills. To the north, the land drops more steeply to the Nisqually River. 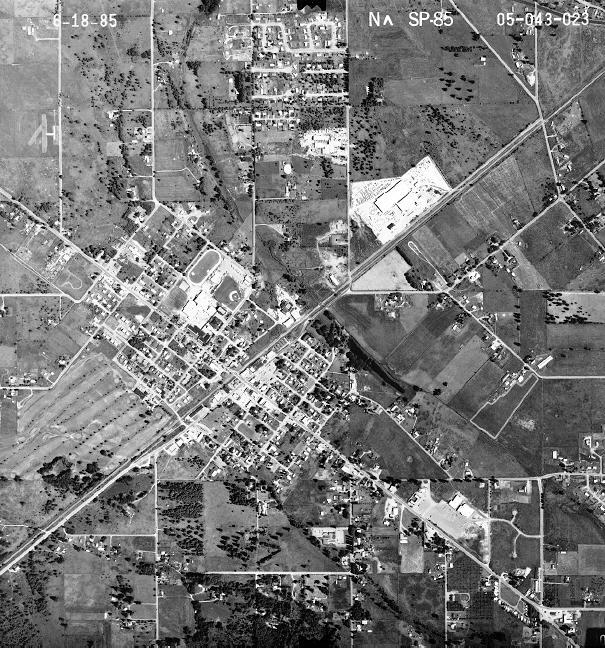 History: Pioneers settled the prairie in the late 1800s, and the town developed a dairy-leased economy. The town was incorporated in 1924 and grew slowly for the next half century.